859 people read this post. London: We live under the omnipresent shadow of a political/economic system, which promotes materiality, selfishness and individual success over group wellbeing. It is a model of civilisation that is making us miserable and ill. Dependent on continuous consumption, everything and everyone is seen as a commodity, and competition and ambition are extolled as virtues. Together with reward and punishment this trinity of division has infiltrated and polluted all areas of contemporary life, including health care and education. It is a system that denies compassion and social unity, unhappiness and mental illness, as well as extreme levels of inequality (income and wealth) flow from the unjust root, causing social tensions , eroding trust and community. Over half the world’s population (3.5 billion people) live in suffocating poverty on under $2 a day (the World Bank’s official poverty line), whilst the wealthiest 10% owns 85% of global household wealth. This level of inequality is growing, is unjust and shameful, and has far reaching consequences. Materialistically obsessed societies such as America (where income and wealth inequality is the highest of any industrialised nation), have higher levels of drug and alcohol dependency, mental illness, crime and incarceration, as well as child pregnancies and homicides, than more equal nations. People in unequal societies are suspicious of ‘the other’ – that’s anyone who looks thinks, and/or acts differently – and generally speaking don’t trust one another. A mere 15% of people in America confessed to trusting their fellow citizens, compared to 60% in less unequal parts of the world. The resulting divisions aggravate social tensions, fuelling criminality and a cycle of mistrust and paranoia is set in motion. We were taught that desire and attachment to the object(s) of desire is the root of all suffering. This message of moderation and balance is more relevant today than perhaps at any other time. Those who love material objects are less inclined to love other people and the natural environment. 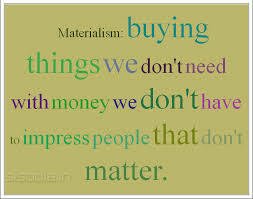 So says Tim Kasser of Knox University, Illinois in ‘The High Price of Materialism’ after various studies. Love of objects strengthens the desire principle, causing fear and dissatisfaction, giving rise to anxiety, stress and unhappiness. Desire entraps: insatiable, it breeds fear and is the underlying cause of discontent and all manner of associated sufferings. “Abandoning all desire and acting free from longing, without any sense of mineness or sense of ego one attains to peace.” Such perennial truths expressed by visionary teachers are ignored in the search for immediate happiness derived from sensory pleasure. With its focus on the material – including the physical aspect of our-selves – the ‘monetised’ system encourages vanity, selfishness and narcissistic behavior. Further strengthening division, separation and aloneness, feelings that are in opposition to the underlying truth of human unity. “All differences in this world are of degree, and not of kind, because oneness is the secret of everything.” This is the view repeatedly enunciated by those great men – divine men some would say – who have freed themselves of all limitations and have shared their wisdom with us. With reward and punishment come desire and fear, desire for the reward and fear or anxiety over possible punishment if we fail. The effect is individual discontent and collective disharmony. Selfishness is strengthened, and, in opposition to the underlying impulse to be helpful, kindness is sacrificed, creating the conditions for depression and stress. Studies undertaken in San Francisco found that those members of the community who “ volunteered and engaged in other forms of giving when they were adolescents were much less likely to become depressed, even as they got older. New research suggests there may be a biochemical explanation for the positive emotions associated with doing good.” [ Healthy Living ] Serving the needs of others is de-centralising, it shifts ones focus away from the self, with its petty, albeit painful anxieties.